Come on guys, the over-the-shoulder thing looks silly enough when women do it. We know by now that wearing your coat around your shoulders like a cape has became one of those styling tricks that somehow signals to others that you are chic and most certainly work in fashion (same goes for the new "tucking your hair into a turtleneck" movement), but it looks ridiculous. Well, OK, it was mildly interesting as first, like, "Oh, cool, it looks like she was out late at the theater and got chilly so her beau gallantly draped his overcoat around her tiny frame." But then more and more women started doing it, and now the whole thing has a whiff of "keeping up with the high school in-crowd" conformity. We could go on about how this trend completely mystifies, how many times we&apos;ve wanted to shout, "Just put your arms through the sleeves!" in the manner of Buffalo Bill in The Silence of the Lambs when he yells, "Just put the lotion in the basket!" to his hapless victim trapped in a well. And now dudes are hopping on the bandwagon. 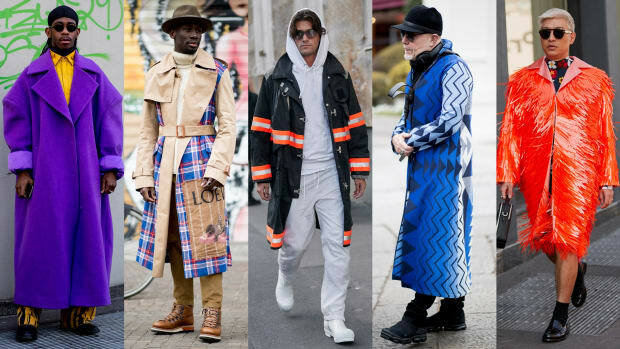 While checking out the street style outside the Fall 2014 menswear shows -- currently wrapping up in Paris -- we couldn&apos;t help but notice now many gents are now draping their outerwear across their shoulders as well. And guess what? It looks even more ridiculous than when the ladies do it. To celebrate in the silliness, we put together a slideshow of the worst male offenders caught sporting the look around Milan. Click through to see the male peacocking on full display. The street style crowd fully supports over-the-top outerwear. Gauchos are all over Pre-Fall 2014.